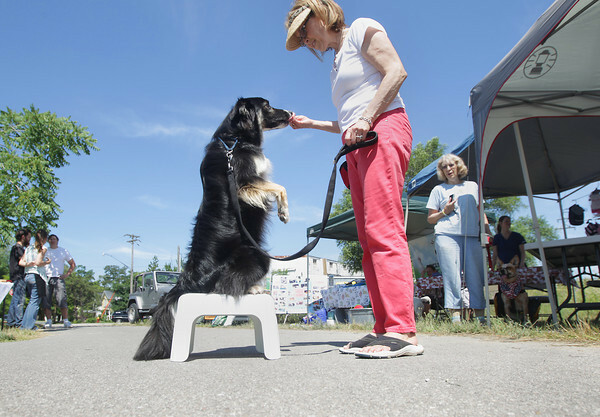 BB, a border collie, demonstrates balance and strong core muscles with owner Kathy Frost, owner, canine massage practitioner and canine fitness trainer at K9 Body Works, Saturday, July 13, 2013 during Furry Friend Day at Oryana Natural Foods Market in Traverse City. "It's all about teaching the dogs how to acquire strength, balance and flexibility for longevity of health, and teaching the owners how to work with their dogs," Frost said. The event included a variety of pet-related exhibits, kittens from the Cherryland Humane Society and a pet parade.